We offer rental hearing aids for trials. 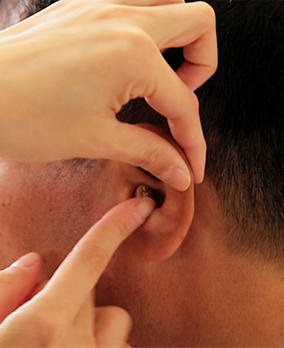 Ryukyu Hochoki has the largest number of locations in Okinawa, specializing in hearing aids. Loss of hearing can affect conversation and communication with your family and those around you, but you are not alone. At Ryukyu Hochoki, we offer professional assistance to resolve your struggles with hearing and support your everyday hearing needs. The hearing aids we offer are very small and discreet, and our hearing aid expert will be happy to assist you on your journey to better hearing. All trials of hearing aids are also free of charge. The joys of better hearing. We welcome you to contact us about hearing better and hearing aids. You can have a world standard hearing evaluation right in our shop. You can try the hearing aid(s) on and get fitted. Receive advice and adjustments from our qualified specialists. There are three major types in the shape of hearing aids as shown below (in the ear, behind the ear and pocket type). Because each type offers varying characteristics, it's important to choose what's best for you according to your lifestyle and hearing. One of the smallest types, making them discreet. As they fit in your ear canal, it's almost completely invisible and the fit is natural. Very comfortable and easy to operate. Fits behind your ear and connects to fit in your ear canal. Small, light, and there are various types and functions to meet the needs of a wide range in hearing levels. The easiest device to use because of its large size. An earphone is connected with the pocket hearing aid. We do not require medical statements, but if you are presently experiencing any loss in hearing, pain in your ear(s), or dizziness, we recommend you consult with an otorhinolaryngology's (ear, nose and throat doctor). You can, of course, opt to visit our shop right away, as we have equipment for hearing evaluations. Visit us at Ryukyu Hochoki. Talk to us about your hearing issues; when you find it most difficult to hear, what type of sounds, and other details. Please feel free to ask any questions you have about hearing aids. Your current hearing will be evaluated accurately. 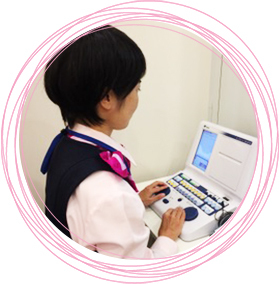 Through a hearing test, we will evaluate your level of hearing pure tones and speech. Referring to the hearing evaluation, we will assist you in choosing the best hearing aid(s) that match your hearing level, lifestyle, and needs. 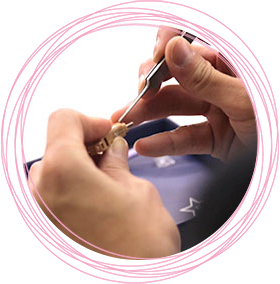 You will actually try on the hearing aid and we will make careful adjustments on the range, quality and output of sound through the device to meet your hearing level. We will measure the improvements in your hearing with the hearing device on. Finally, you can purchase the hearing aid that's right for you. Hearing aids are custom made to meet your hearing level and the shape of your ear(s). It will take about a week to ten days for your hearing aid(s). We will continue to check the level of your hearing in various environments even after the sale, and will continue adjustments as needed for you to be completely satisfied with your hearing aid(s). Please do not hesitate to contact us if you have any questions or problems. Copyright © 2015 Ryukyu Hochoki. All rights Reserved.